Five months of goatkeeping has been such a joy that I almost forgot the whole point --- milk! But Abigail's production has been increasing quickly, and even though the kid is still drinking as much as he wants, our doe shared a pint yesterday with her human caretakers. Time to figure out the dairying side of goatkeeping. As usual in the caprine world, I've got more questions than answers at the moment, so I hope you'll chime in with your wisdom. To wash or not to wash? The udder that is. Older advice was to wash and dry the udder before milking, but newer sources suggest that you might actually move more bacteria toward the milk that way than you remove. Unless there's actual dirt on the teat, many modern experts simply recommend dipping the teat in a disinfectant instead of washing. Others say you shouldn't dip the teat until after milking, and that the dip's purpose is to prevent bacteria from getting up inside the teat and causing mastitis. What do you do? What kind of teat dip do you use (if any) and when? And won't the chemicals from the dip end up in the milk if you use it before milking? What to do with all that milk? Wow, even a pint a day seems like a lot of milk and production is likely to continue to rise for the next few weeks. I want to start experimenting with cheesemaking, but most cheeses seem to require cultures (except for the lemon juice method that most people say isn't very good). Do you have a culture source you particularly recommend? A way to grow your own cultures so you don't have to keep buying them? Which cheese recipes have worked well for you with goat's milk? And what cheese-making recipes do you recommend? Finally, if that kind reader who once offered us a buttermilk culture is still around, I'd love to take you up on that kind gift now! We've kept both milk goats and a couple jerseys over the years. We've always washed before milking with warm water (feels great in the winter) a couple drops of dawn dish soap, and a drop of bleach. Bring 2-3 cloths with you - 1 or 2 to wash with, and 1 to dry with. Sometimes if mama goat/cow is uncooperative you'll get a hoof that goes up to the udder and you'll want to re-wash. That's where an extra cloth comes in handy. In the spring with our jersey she'd usually end up with runny poo from all the fresh green grass. Then we'd need 3-4 cloths. Dip with iodine afterwards. You can buy the special teat dip, which is pricier - or I used to buy the large bottle of "Iodine Wound Spray" at the feed store. It's basically the same stuff at a lot lower price. We have a friend that runs a dairy that sanitizes (Iodine) before and after milking. He dips, lets it sit as he goes down the line, then goes back and washes with hot water and cloth; dries, milks then dips again. He has the lowest bacteria counts in the entire state. Cheesemaking - you can buy cultures at http://www.cheesemaking.com/ If you do a double batch of your culture when making milk you can put half the culture in ice cube trays and freeze. You can then use a couple of cubes to make the next batch of culture for cheese, or to refresh your stock of frozen culture cubes. Kind of like doing sourdough. Hope that helps. I recommend Ricki Carroll's book. Until you build a cheese press you are likely stuck making soft cheeses (not a bad thing) so you will probably only need a little mesophilic starter. I got mine from Steve the cheesemaker online and have good success. The book shows how to propagate this so you only need to buy it once as long as you keep making new starter every 6 months or so. Additionally, I think lemon cheese is actually pretty good, and there are several cheeses that can be made using mostly citric acid. Good luck! 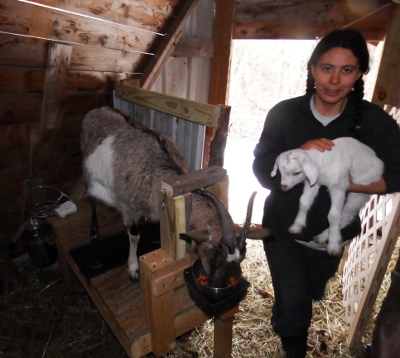 http://www.fiascofarm.com/ is the single best resource for everything you need to know about caring for goats. She isn't too far from your neck of the woods, either, so you don't even have to do much interpretation on things that are affected by climate and native plant species. I've tried many different cleansing methods for my milking routine, but Molly's recipe is the best. I've always found it necessary to clean them because they lay down and stuff sticks to their udder. I like to clean the udder with simple soap and water prior to milking. Afterward I dip the teats in a solution that is 1 pint of warm water, 1 tsp bleach, and 3 drops of blue dawn dish soap. I know it sounds harsh, but after trying many methods and my goats and myself having problems ranging from dryness to mastitis as a result of the experimentation I stopped messing around and stuck with what Molly had taught me. We use a solution of a few drops of grapefruit seed extract and a few drops of tea tree oil in a pint of water. we spray it on (not the whole teat, just where our hands will go) and then wipe off with a paper towel until dry (we are not thrilled with the use of a paper product, but it works so well). After milking we spray a tiny bit more of this natural disinfectant and leave it on the teat. We filter the milk immediately and cool it in an ice bath before refrigerating it, or we start the cheese making process while it is still warm. Enjoy the fruits of you labors! Oh! I forgot a really important aspect of cleansing the udder before milking. When you clean them use warm soapy water and a messaging action. It helps their let-down. Some does let down easily, but others are helped by the pre-milking message tremendously. 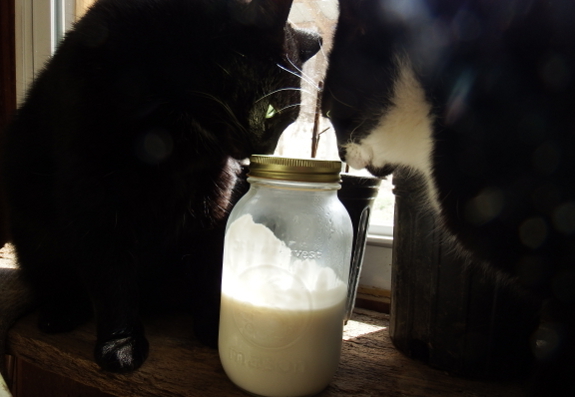 If you have Kefir just add some to your goat milk and you will soon have more Kefir. When we had goats we washed them. Less smell in the milk. That and get it cold as quickly as possible. I don't mind goat milk but I do not care for goat smelling milk! To wash or not to wash? I always do. Now I use an udder was solution from Caprine Supply (http://www.caprinesupply.com/iodine-udder-wash.html). Since it is concentrated, the gallon we bought will last us for many years. While the kids are still nursing, I do not use a teat dip (http://www.caprinesupply.com/foan-n-dip-teat-dip.html) when I finish milking, but I do after they are weaned. This helps to close off the opening of the teat to prevent bacteria from entering and causing problems. My milking routine. I was the udder. Squeeze the first milk stream into a strip cup (http://www.caprinesupply.com/strip-cup.html) to keep an eye on the udder health. Milk into a stainless steel bucket that was prepared by dousing with boiling water. Strain the milk into half gallon glass jars through cloth filters. We set the jars of milk into a bucket of cold tap water to quicken the cooling process and keep the milk as fresh as possible. We do not pasteurize. I would highly recommend the book, Goats Produce Too! (http://www.amazon.com/Goats-Produce-Udder-Real-Thing/dp/B000RNEYN4/ref=sr_1_5?ie=UTF8&qid=1426452480&sr=8-5&keywords=making+goat+cheese) for making cheese. I haven’t tried to grow any of my own cultures, but if you culture some buttermilk (http://www.caprinesupply.com/buttermilk-direct-set-culture.html), you can then use some of the previous batch to culture the next batch. If you choose to use rennet (http://hoeggerfarmyard.com/xcart/Liquid-Rennet.html, make sure it is not GMO. Unfortunately, the vast majority of cheese made in the U.S., and most of the rennet, is GMO. So, I am very picky about which rennet I buy. From this book I have made mozzarella, cheddar, chevre, cottage cheese and fresh pressed herb cheese. This will be our third year to make cheese and I still feel like a novice. It does get much easier as time goes by. We also culture kefir from our milk each day. I would recommend it over yogurt because of the additional cultures and yeasts it contains. But that’s just my preference. Hope this helps. It looks like you’re off to a great start! I concur with the practice of washing before milking! I use an udder wash concentrate that I got at our local dairy co-op. It is a huge jug and you dilute it so it lasts years for us. Wash, then dry, and then do a couple of squirts onto the ground or into a rag. I have one of those strip cups too. I used it at the beginning but I don't anymore. One more thing to wash. If something is wrong I can see it in the milk going into the jar and feel it with my hand as I squeeze. And, after I use an iodine teat dip. I used to use a spray-on treatment after milking as that is what the lady who introduced me to goats used. However that stuff is expensive and the iodine dip keeps the teats soft. I dip even if the kids are on. They say that the kid will keep the teat clean, and that is true. But unless the kid latches on directly after milking I'd rather dip to keep bugs out until baby is back. We have had years where there was just waaay to much milk. We fed the extra to the chickens. Or pigs, if we had them. I love to make paneer, only I use apple cider vinegar, not lemon juice. If you aren't into paneer, it is a half-step away from ricotta, which you probably already have recipes that use it. I second the Fankhauser recommendation. But my cheesemaking bible is Ricki Carrolls "Home Cheesemaking" and her website is also loaded with recipes and help: www.cheesemaking.com I have made chevre also.. Yummy but not as quick. Mozzarella is quick too, but I have never really mastered it, myself. My favorite cheese to make is brie.. I age it just in the fridge; I don't have a really good place to use as a cheese "cave" so I haven't made anything that requires any precision.. when/if I ever do, I really want to make a parmesan type of cheese. That kind will take forever but it would relieve us of storebought cheese entirely, I think. I have made yogurt but it is not like cow's milk yogurt. I like it fine, but my son won't eat it so it don't make it much. It is not thick. It makes a good yogurt smoothie though. Can't wait to hear about your adventures. Good luck!